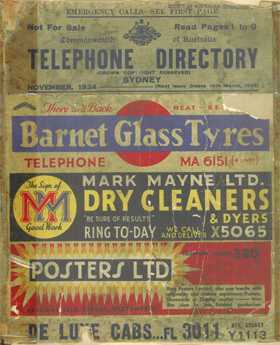 This New South Wales Telephone Directory includes the city and surrounding suburb exchanges of Sydney, including: the City North, the City South, Ashfield, Castle Hill, Liverpool, Manly, Sutherland and many more. Also included is a Pink Pages section which is a classified business and professional section of the Telephone Directory. It contains a list of telephone subscribers and their respective professions or trades. It's a valuable genealogy resource for anyone searching a family history in Sydney or building a family tree.